It’s not that I don’t love spending time in the Parque Nacional Chagres or in Lab 230 at the Smithonian, but sometimes, one needs fresh air. Last week, I took the opportunity to go help out my supervisor in the easternmost province of Panamá, the famous (or rather infamous) Darién province. This province is mostly known for the Darién Gap, an area that literally splits the Americas in two. There are no roads through the Darién Gap… as in none, not even a gravelly sidetrack. The Pan-American Highway that is supposed to link Alaska to the Southern tip of Chile does not cross the Gap. 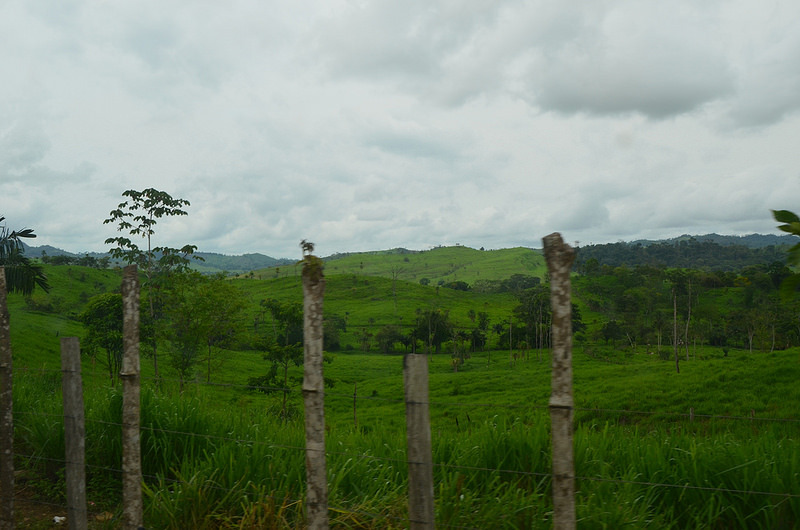 Both sections stop short before the Gap, the Panamanian and Colombian sections being separated by 100 km. If you ever get the idea of crossing the Gap on foot, you will have fun going through the Colombian side (one giant swampland) and the Panamanian side (mountains averaging 1,500 meters covered by one of the densest rainforests that you can imagine). Good luck! Basically, the government of Panamá refuses to extend roads into the Gap to prevent drug trafficking from Colombia, and it works pretty well too. Another particularity of the Darién province is that, even though there is no land border with Colombia, one needs to pass through a border checkpoint when entering or leaving the province. At the checkpoint, everyone has to exit their car (or bus), show their passport or Panamá ID, and explain why they are going into Darién, for how long, who they are, what their credentials are, etc. But enough about the Gap, Dr. Donald Windsor and I were going to Santa Fé del Darién which is located in the Western portion of the province. The mission: to work out an experimental design with the Centro Agro-Pastoral de Santa Fé to study the effect of a hispine beetle on rice production. This beetle, Oediopalpa guerini, seems to be an important pest of rice in the area, and a big problem for local growers. 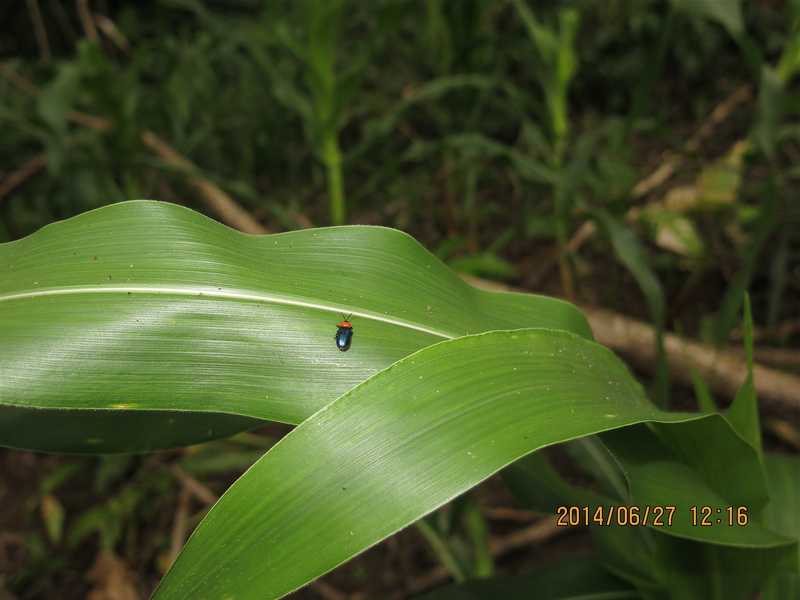 Good news, we found lots of beetles (not a good news for the growers). We surveyed a few fields in Santa Fé and around Cucunatí, a village only accessible by fording a river at low tide. 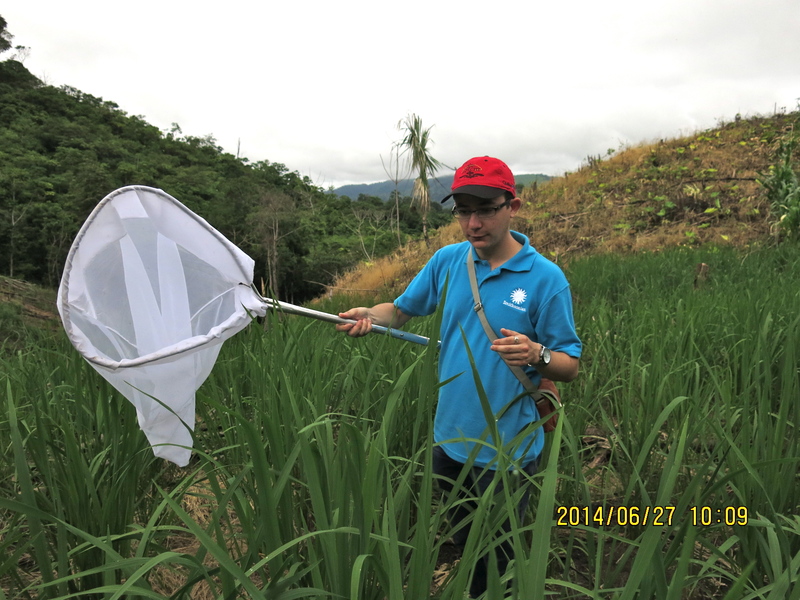 In the last field we visited in Cucunatí, every single plant that we looked at was infested. This will be a pretty cool project that will start by the end of July. 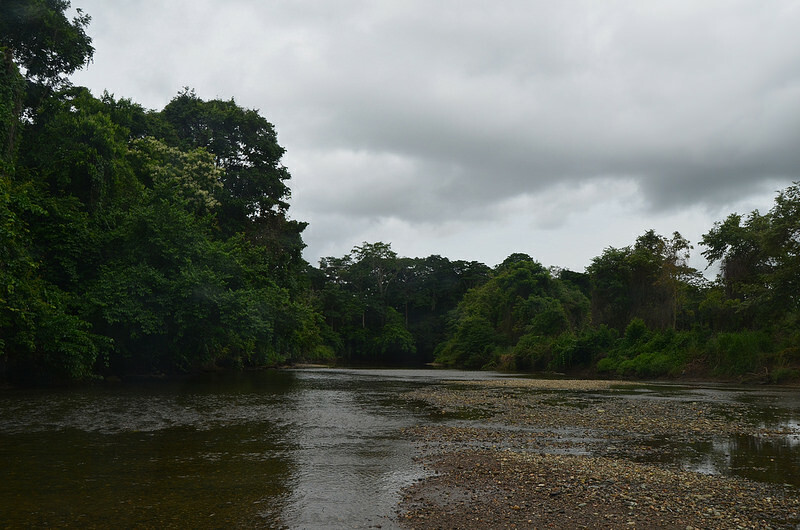 To reach the village of Cucunatí, one must drive (or swim) through this river. At low tide, a pick-up truck can pass with the water reaching the mid-wheel. At high tide, this village is inaccessible by road (Photo: Nicolas Chatel-Launay). An adult Oediopalpa guerini in Cucunatí (Photo: Dr. Donald M. Windsor). Darién is mostly an agricultural province. It is here that Vasco Núñez de Balboa first crossed from the Caribbean Coast to the Pacific Coast in 1513. Consequently, the currency of Panamá is called the Balboa, even if it is now linked to the US Dollar. Balboa is also a popular beer. At the exception of the Gap and the comarcas (areas governed by native people), there are very few sections of forest left. This province is one of those where most of the tropical diseases still flourish, be they Chagas disease, yellow fever, typhoid, malaria, dengue fever or leishmaniosis. Darién is populated by agricultural producers who cultivate small fields only sufficient to feed their family and produce small surpluses for village markets. As in many tropical areas, fields are regularly set ablaze before being planted with corn and rice. Darién is also covered by pasture areas for cows raised by rather poor local farmers for the benefit of wealthy landowners from the capital and abroad. Most of these pastures are seeded with African varieties of fast-growing grass. Finally, a great deal of land has been converted to teak plantations, a hardwood tree that is eventually exported to Asian markets. It is weird to drive in a province where most of what you see is either forests formed by straight rows of an introduced tree, charcoal-coloured soil planted with two introduced cereals, or vast prairies of an introduced grass. Let’s just say that it is not an environmentalist’s dream. A pasture typical of the area, composed of African grass, located between Santa Fé and Cucunatí (Photo: Nicolas Chatel-Launay). Nevertheless, some areas still look natural, especially near rivers and creeks. These disturbed patches harbour a great variety of short-lived, fast-growing species. These form an ideal refuge for one of the greatest insect diversity I have ever seen. Along rivers and creeks, native bamboo still grows (guess what, Asian bamboo has taken over most of the country). Of course, that was the second goal of our trip. We were looking out to see if, where native and introduced bamboo coexist, the herbivores attacking native bamboo would switch to feeding on the introduced one. Well we found out last week that… they do. 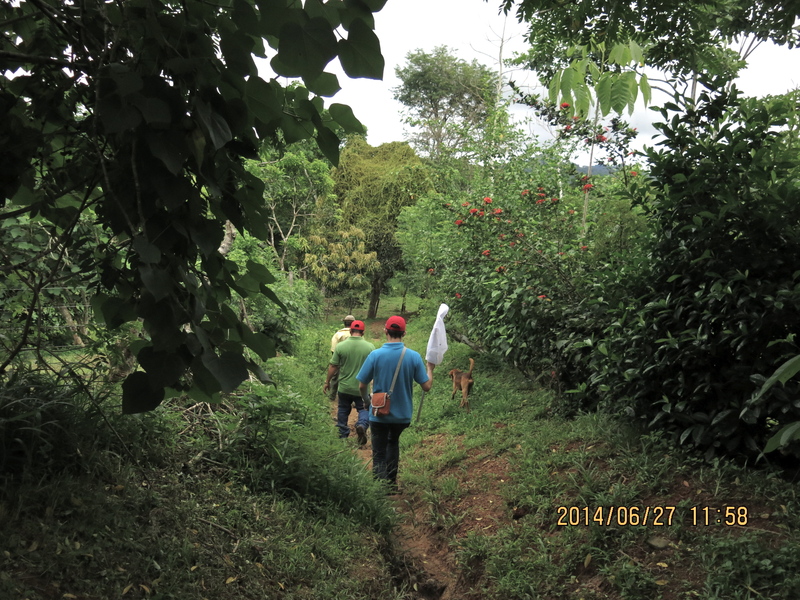 In order to get to one of the fields near Cucunatí, we crossed a regrowth area bordering a small creek (Photo : Dr. Donald M. Windsor). Overall, it was a fun trip, met with success. 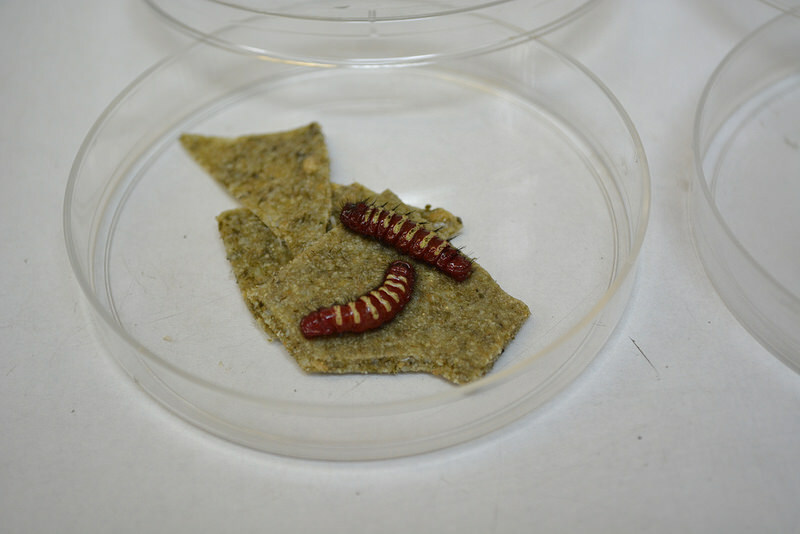 Now, I’m back at the lab to see if my new artificial diet formulation will be accepted by my fussy caterpillars. For now, they have refused everything I have tried. 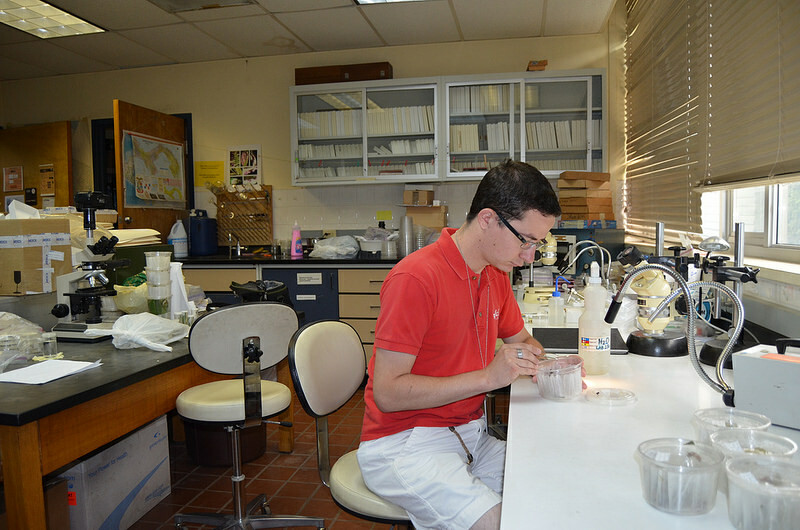 Back in the lab feeding caterpillars (Photo: Nicolas Chatel-Launay). The caterpillars obstinately refuse to feed on my newest formulation (Photo: Nicolas Chatel-Launay). 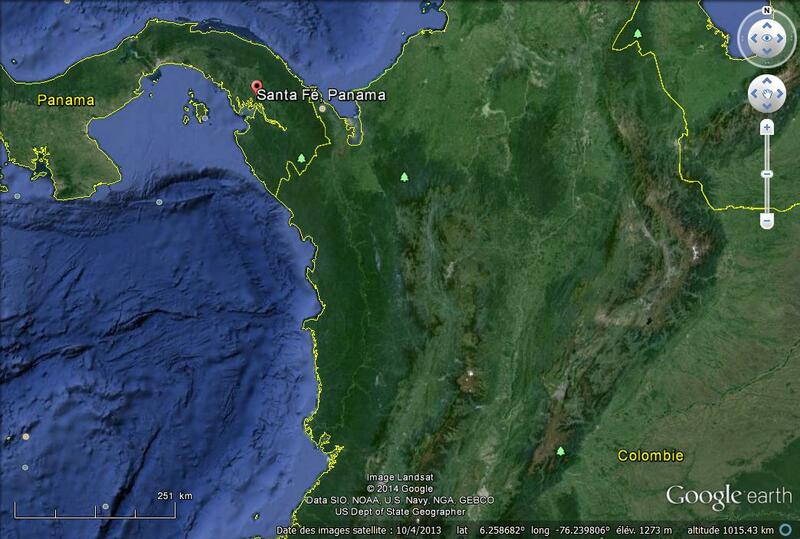 ← Why the hell am I in Panama?